Roll your mouse over the link to our exclusive Bevco Ergonomic Seating FREE Casters offer to get your FREE dual-wheel, hard-floor standard (non-ESD/non-cleanroom) casters with the purchase of a select 7000 Series Chair. This limited-time promo runs from April 1, 2015 through June 30, 2015 and is free of restrictions on the quantity of chairs you may order. The FREE Bevco 7000 Series polyurethane chairs have been manufactured to provide a durable, scratch-/stain-/puncture-resistant, high-comfort seating experience. Featuring contoured seats and backs, their design allows for increased air circulation, support, and easy maintenance. Meeting or exceeding ANSI/BIFMA standards, Bevco 7000 Series Chairs are also LEED-certified and include a 12-year warranty against defects in materials and workmanship, with lifetime warranty on the cylinder. When you place a 7000 Series Chair(s) into your shopping cart at QSource.com, the FREE casters will be added to your order automatically. 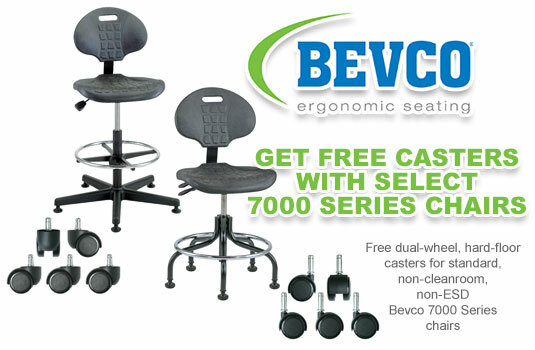 To place your order for Bevco 7000 Series Chairs and get your FREE casters, get that mouse moving to our Bevco 7000 Series Chairs FREE Casters Promo page. For additional info or questions about our promo, you may also contact us by phone (800-966-6020), email, or via our Web site.